The Chilean acknowledges the love from the Yeovil fans. Being a United fan is often a privileged experience where you’re treated to watching some of the greatest exponents of the beautiful game doing their utmost to carry your side to victory. It must truly grate other supporters when they see Reds lamenting the fact our £75 million striker has ‘only’ managed 18 goals by January, or the homegrown 20 year-old who’s already an England regular is ‘suffering a bit of a dip’ that sees him just beat the full back six times a half instead of seven. Despite being treated to seeing some of the most gifted players on the planet play for my team, it was arguably in two charity matches I witnessed the two greatest ever. Once during a Sir Matt Busby testimonial in the early 90s, I was lucky enough to see George Best grace the pitch, although he was clearly overweight and knackered after a mere matter of minutes, he did manage a bit of keepy uppy during the game that had the crowd cheering and in the very least gave me a story to tell the grandkids, regardless of how tenuous the ‘I saw Best play’ claim may truly be. The second time I watched a contender for the title of ‘best player in the history of association football,’ was when another somewhat overweight former superstar sauntered around the Old Trafford turf as part of a charity match. Watching Maradona dispatch a penalty past a hapless Jamie Theakston was one of the more surreal moments in my life but at least it gave me another story to tell my non-existent grandchildren. One of the overriding memories I have of Maradona’s appearance wasn’t how amazing it was to actually witness the scourge of midfielders – apart of Bryan Robson of course- pottering around the pitch, it was the crowd’s reaction, who rather than rejoice in the idea of seeing a legend raising money for sick children, or whatever the cause was, they decided to boo him. My brother decided to take matters into his own hands during the said charity game by loudly telling the crowd they were all “a bunch of clueless muppets” but to no avail. Every touch by the diminutive icon was greeted by the sort of jeers usually reserved for a Jon Moss refereeing display. It was a bit bizarre and no doubt borne of the time in 1986 when Maradona decided to embarrass Peter Shilton by beating him to the ball with his hand helping his team reach the semi finals of the biggest competition in World football in the process. I’m not condoning cheating but how many others of us wouldn’t have been tempted in the heat of the moment and Mexican sun, if it gave us a chance of immortality? 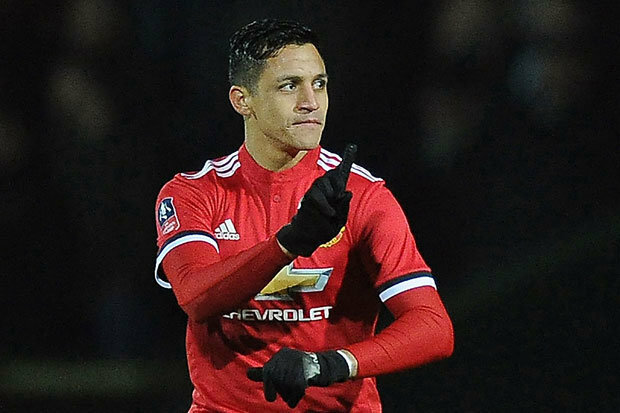 Last night’s victory over Yeovil Town will be remembered for one thing and one thing alone, the debut of Alexis Sanchez, a player who’s somehow gone from sought-after talisman, to overpaid, drug-taking, mercenary in the space of a few weeks. One of the stranger elements of United’s routine 4-0 win over the Somerset side, was the home crowd’s treatment of the Reds’ new signing. Every touch by the Chilean was greeted by a chorus of boos which were as baffling as they were consistent. What could possess a set of fans used to watching the likes of Bernard Zoko and Otis Khan, to decide to boo probably the most talented footballer many of them will ever see grace the bobbled Huish Park turf? Perhaps the assembled masses were blaming Sanchez for Chile’s overstated role in helping the UK win the Falklands conflict, many of them may have felt the information passed on by the Chilean government which was believed to be of great use to the British military was actually superficial and merely a ploy to curry favour with Margaret Thatcher rather than a concerted effort to help the Brits regain the islands. Maybe the jeering crowd were so incensed by Sanchez’s failure to take a stance on the Dakar rally which runs through parts of Chile and has been criticised for causing damage to the country’s geoglyphs that they simply could no longer contain their anger. It may even have been, as I suspect, the thousands of Yeovil fans baying for Sanchez’s blood, felt that ever since Mary the 1st was declared Queen of Chile in 1554, that the country should never have fallen into Spanish hands and were unwilling to let over 400 years of misappropriated sovereignty go unpunished. It’s not just the Yeovil fans who were pushed past the point of sanity by Sanchez’s transfer to United, commentating for the BBC, Martin Keown gave the kind of passive aggressive, bitter analysis that made Mike Summerbee’s reaction after Wayne Rooney’s derby day overhead kick seem positively balanced. Keown who’d labeled Sanchez the “worst kind of footballing mercenary” for choosing to join the biggest club on the planet rather than the one sat atop the Premier League, struggled to contain his contempt for the former Arsenal attacker. By the end of the game even the FA Cup’s official Twitter had taken to trolling Keown’s bitterness towards Sanchez and in a move that may have come from a producer whispering in the former defender’s ear about how his commentary was being received, Keown handed Sanchez the man of the match award, which felt a bit like buying someone an air freshner after you’ve taken a dump in the middle of their front room. It’s obvious from the reaction of Keown, Yeovil fans and many in the media that Sanchez’s decision to forego the millions of Arsenal and City and take the millions of United isn’t going down well, and some of it may be justified, after all who couldn’t feel a pang of jealousy seeing a player of his calibre join a team that’s already full of stars and whose fans and manager still find ways to complain about being hard done by? For United fans though, the anger being exuded from the likes of Keown, Arsenal, City and erm, Yeovil fans is a joy to behold, it shows just how important the Sanchez signing was and with two assists, a man of the match award and several buckets of boiled p*ss already on his United cv, the Chilean is destined to become one of the most hated figures outside of Old Trafford, a hatred even Maradona would be proud of and one that will see him adored by Reds everywhere.